Viking Swords for sale include a wide selection of styles made by popular manufacturers. Many of these Viking Swords are inspired by real swords that were wielded in medieval Europe. Blade options available include functional and blunt reenactment. Buy all types of Viking Swords, axes and more on sale now. Suontaka Viking Swords for sale weigh 3 pounds 1 ounce. These functional swords are designed like the real tenth century Suontaka sword that was discovered in a woman's grave in Finland. 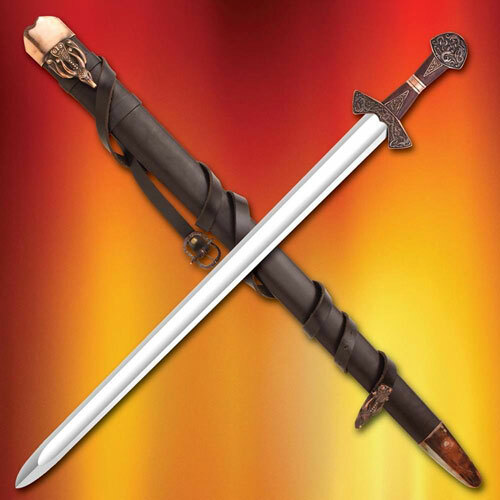 This sword is 37 inches in all and features a 30 ¾ inch 1065 high carbon steel blade. The tough carbon steel blade has a full tang and is fully tempered and peened over the pommel. The blade is 1 ¾ inches wide and 3/16th of an inch thick. The pommel is engraved with a Viking knot design. The beautifully engraved guard, grip band and inserts are lavishly plated in rich copper. The custom real leather scabbard is accented with copper fittings and features a baldric. Buy the Suontaka Viking Swords for $319.99.